The MicroScanner 2 Cable Verifier presents a revolutionary change in voice, data, and video cable testing. It starts by taking results from what was four different test modes and displaying them all at once – graphical wiremap, pair lengths, distance to fault, cable ID, and far end device. 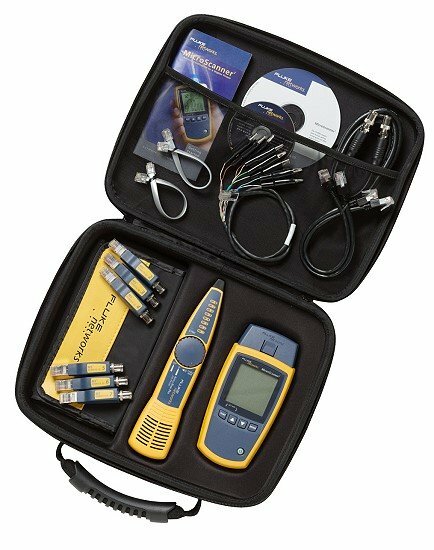 What's more, its integrated RJ11, RJ45, and coax test ports support virtually any type of low-voltage cable testing with no need for awkward adapters. The end result is reduced test time and technician error. That makes high-quality installations more efficient than ever. Today's communications technicians have a lot more problems to deal with than just the cabling. They have to rule out a whole host of potential cable and service issues before determining the cause of a connection problem. Is there telephone voltage? What's the polarity? Is there an Ethernet switch at the far end? Is PoE available? MicroScanner2 acknowledges this, giving technicians high power vision to verify today's most common voice, data, and video services. That means faster, more comprehensive troubleshooting.